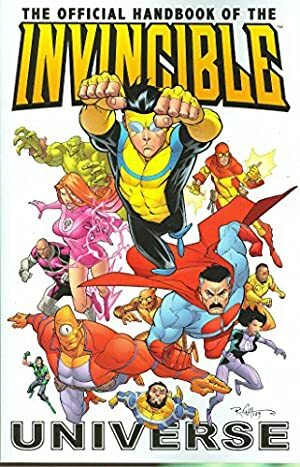 Invincible is an Image comic book that started in 2002. It later became part of the Skybound holdings. The latter being because it was created and written by Robert Kirkman, likely best know for his The Walking Dead comic book since it became a hit TV series. Like TWD, Invincible used a high-#engagement storytelling style with lots of drama, gore, shocking twists, death of major characters, etc.. 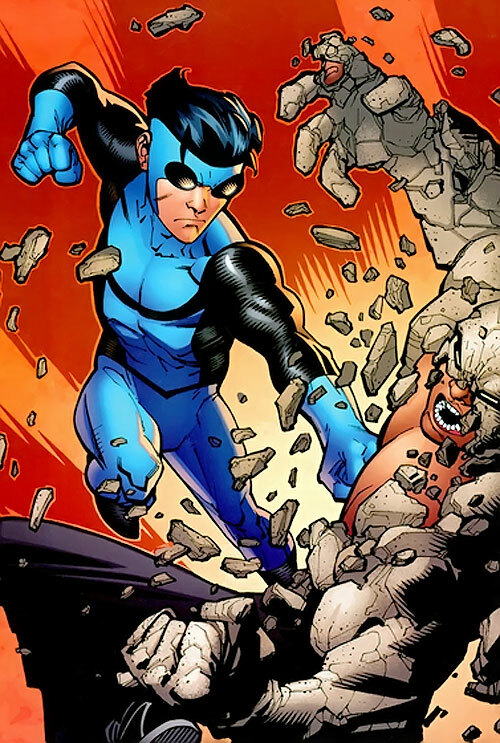 It takes place in an original super-hero setting, and the success of Invincible and other Kirkman-and-friends series made the Skybound super-hero setting quite expansive. 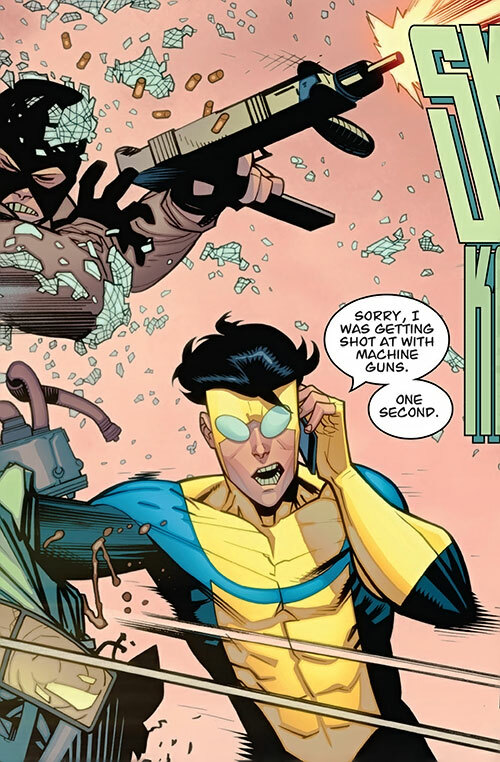 Invincible himself is a sort of Superboy expy , but a much more modern one using different genre conventions. Real Name: Markus “Mark” Sebastian Grayson. Known Relatives: Nolan Grayson (father), Debbie Grayson (mother), Oliver Grayson (half-brother), Samantha Eve Wilkins (fiancée). Group Affiliation: Guardians of the Globe II, Invincible Inc., formerly the Teen Team. Base Of Operations: Utah, United States of America. 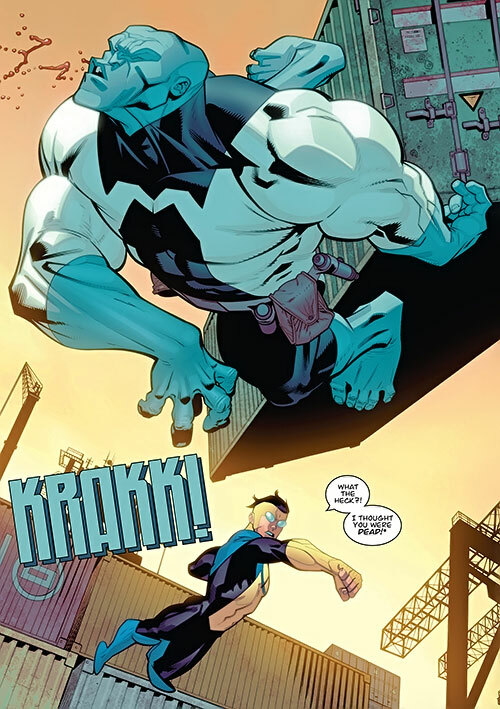 Mark Grayson possesses the awesome superhuman strength that one would expect to find in a Viltrumite male of his age, height, weight and build who engages in intense regular exercise. This places his strength level within the “Class 100+” range, allowing him to lift (press) weights far in excess of one hundred tons directly overhead. As a Viltrumite/Homo-Sapiens hybrid, Mark possesses vast superhuman strength, speed, durability, stamina and the gift of flight. He possesses these traits in quantities that are many times greater than that possessed by any other earth-born hero he has encountered thus far. His body is virtually invulnerable. He easily resists intense impacts, high calibre gun fire, and extremes in temperature with no outward sign of damage or discomfort. The biochemical processes of his body are so efficient that he could survive for days on a single lungful of air. In the unusual event that he sustains serious injury, his body will completely recover from the damage at a superhuman rate. Mark’s reaction time is far superior to that possessed by a normal human. He is capable of reacting to visual cues within a fraction of a second, and can move the entirety of his body at a rate of speed so great that the naked human eye is incapable of perceiving his movement. Moreover, through the sheer force of will alone, Mark can fly at fantastic speeds. In the past he has demonstrated the capability of traveling over 8000 miles in less than 25 seconds within the Earth’s atmosphere. He can achieve even higher speeds within the vacuum of space. Finally, Mark will enjoy a greatly extended lifespan in comparison to the average human being. As a Viltrumite, he can fully expect to live thousands of years. See the “Generic Viltrumite” write-up for a more in-depth discussion regarding the powers of an average Viltrumite. Unlike many other heroes, Mark has no real special skills or abilities outside of those one would find in an average young adult. He has been trained in the use of his own natural abilities, which generally more than compensate for any difference in skill he may have with his opponents. With his raw power, Mark rarely relies on equipment of any kind during his adventures. He has used things like oxygen rebreathers on his adventures that have taken him deep into space or under the sea, though he has discovered that this is unnecessary on shorter trips. The one piece of technology that he uses consistently is a telepathic earplug that is commonly used in Coalition space. The earplug allows sentient beings to communicate in the vacuum of space regardless of the language that they natively speak. Mark shares all of the same vulnerabilities that affect all Viltrumites including the bioengineered Scourge Virus, an intense allergy to the Klaxus plant and an unusually sensitive inner ear. Mark Grayson’s childhood was normal in every way, except for the fact that his father was the most powerful superhero on Earth. On Mark’s seventh birthday his father, Nolan, sat him down and revealed the origin of his powers. Nolan told him that he was a Viltrumite; an alien being whose people were a race of peaceful space explorers. He went on to explain that he had been sent to the Earth in order to hasten humanity’s growth so they could join the galactic community. Finally, he told Mark that one day he would develop super-human powers. Each and every day following his father’s revelation Mark woke up hoping that he had gotten his powers. Unfortunately for Mark, the process took a little longer than he hoped. It wasn’t until his seventeenth birthday that his powers spontaneously manifested. Mark spent the next two weeks practicing their use and during that time even managed to thwart a jewel robbery perpetrated by the super-villain Titan. Over the next couple of months, Mark had several adventures and quickly began to make a name for himself. He encountered the Teen Team and helped them stop the Mauler Twins’ plans to take over the world. It was during this event that he first met Atom Eve, who would eventually become very important to him. It didn’t take Mark long to realize that Atom Eve, aka Samantha Eve Wilkins, actually attended the same high school that he did. The two worked together to stop one of their professors from turning their classmates into living human bombs. It was also during this time that Mark first met Allen the Alien, who had been coming to the Earth for the last 15 years and battling Omni-man to a standstill. Mark took his father’s place in the battle when Omni-man was too busy elsewhere to fight, but instead of just fighting Allen Mark took the time to speak with him. The result of their conversation was Allen discovering that he had been visiting the wrong planet for that whole time, and he left in peace. As time passed, Mark and Eve became close friends but any potential romance between the two was stalled when Amber Bennett (one of Mark’s classmates) asked him out and the two began to date. Shortly thereafter, every member of the Guardians of the Globe (save Omni-Man) were brutally murdered in their secret mountain headquarters. 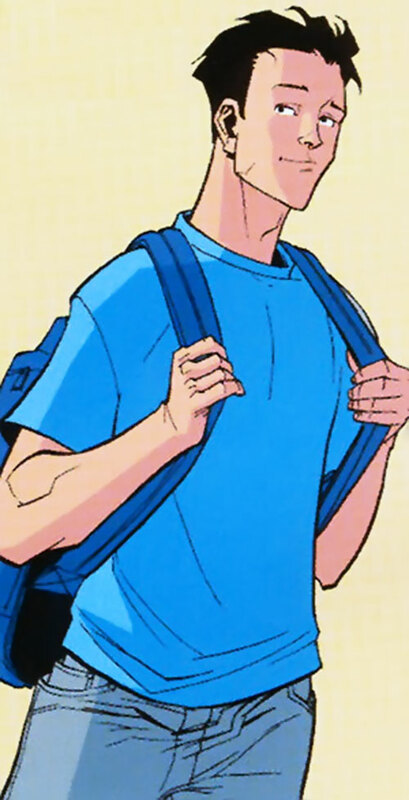 When the Global Defense Agency put together a replacement team, Mark was offered membership along with several members of the Teen Team but graciously declined due to his issues juggling both school and crime-fighting. Approximately a month later, Mark was visiting his favourite comic store when he heard over the news that his father was in a pitched battle against the newly resurrected Immortal, one of the original members of the Guardians of the Globe. Curious (and a little concerned about his father), Mark changed into costume and raced to the scene of the battle. He arrived just in time to overhear Omni-Man confess to the murders of the Guardians of the Globe, and to watch him slay the Immortal once again. The Viltrumites were not the peaceful explorers that he was led to believe they were. Instead, they were world conquerors set on adding the Earth to their ever expanding Empire. Nolan had been tasked with weakening the Earth’s defences, and murdering the Guardians of the Globe had been the first step in that task. Nolan offered Mark a chance to join him in his conquest of the Earth, but Mark angrily refused his offer knowing full well what it meant. The two fought but Mark’s power was eclipsed by his father’s. At the end of the battle, approximately one thousand innocent lives were lost, and Nolan had beaten his son near to death. Though he understood his duty to the Empire, Nolan could not bring himself to murder his son in cold blood and fled the Earth instead. Mark spent the next two weeks in a coma. 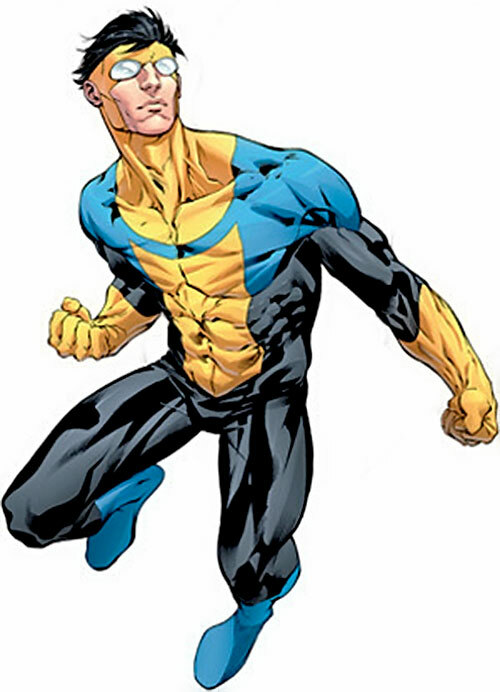 When he awoke he was approached and recruited by Cecil Stedman (his father’s former handler and the head of the Global Defense Agency) to take his father’s role in the GDA and to defend against Omni-Man’s eventual return. Fighting off a second invasion from the Flaxxan Empire. Helping to put a new Aquarus onto the Atlantean throne. Helping the criminal Titan to bring down the crimelord Machine Head (where he first met and fought the alien Battle Beast). Capturing the new psychotic Darkwing. Interrupting the Mauler Twins in the middle of an experimental procedure that led to Angstrom Levy being horribly injured and deformed. Two other important events occurred in Mark’s life during this time. The first was the return of Allen the Alien. Allen returned to the Earth in order to warn Mark that a Viltrumite agent was present on the planet. In response, Mark informed Allen of the events of the past few months and Allen left the Earth intrigued at the possibility that the Viltrumite Empire may not be a unified as he once believed. The second was Eve’s quitting the “hero game” and moving to Africa in order to help the disenfranchised there. With Eve gone, Mark solidified his relationship with his girlfriend Amber by revealing his secret identity to her. Son… Could you lend me a hand ? Soon thereafter Mark was approached by a member of the Thraxxan race. The Thraxxans were an insectoid like people who were in desperate need of help. They needed a being of Mark’s power in order to fight off a unquantified menace. Mark, ever eager to help, agreed to go to their planet and help despite Cecil’s protestations. After two weeks of travelling, Mark arrived on Thraxxa only to discover that the planet’s ruler was none other than his father, Nolan Grayson. After a single tense moment upon their initial meeting, Mark embraced his father and begged him to return to Earth. Nolan refused, citing the fact that the people of Earth would never forgive his treachery and that the Viltrumites already knew of his dereliction of duty. Worse still, they were on their way to Thraxxa to take him into custody. As if that information wasn’t enough, Nolan introduced Mark to his half-brother that he had conceived with a Thraxxan native. The child was already a toddler due to his accelerated metabolism and would most certainly be destroyed by the Viltrumites due to their intolerance for imperfection. Mark agreed to help his father drive off the Viltrumites, but despite their best efforts the two were defeated in a desperate battle against the trio who attacked the planet. It took a full month for Mark and the Thraxxans to recover from the Viltrumites attack. Mark spent that time helping to rebuild the Thraxxan civilization and getting to know his little brother. When the rebuilding was complete, he returned home with his brother and informed the GDA of the coming threat. He attempted to mend some fences with her by taking her to visit Eve in Africa. While he was there Eve attempted to show him that his relationship with Amber would not work but Mark remained unconvinced. The visit was interrupted by a panicked call from Mark’s mother who was being held hostage by a returned Angstrom Levy. Mark raced home to confront Levy and was shocked to see what had happened to him since their last meeting. Angstrom desperately wanted revenge on Mark for his disfigurement and used his dimensional hopping powers to send Mark traipsing through a series of hostile universes (he encountered both Batman and Spider-Man while travelling) in the hopes of wearing him down sufficiently for their inevitable physical confrontation. Mark eventually grew used to the rhythm of Levy’s antics, and was able to force his way back into his home dimension. Upon his arrival, he realized that Levy had injured his mother. The realization thrust Mark into a blind rage and allowed Levy to transport both Mark and himself to a post-apocalyptic world. The two struggled briefly in the deserted landscape, but when Levy intimated that he would return back to Mark’s home and his mother, Mark lost all semblance of control and brutally beat Levy to death. Mark spent the next few hours stranded in the desolate dimension until a future incarnation of the Guardians of the Globe freed him and returned him home. Before they did, a future version of Atom Eve revealed to Mark her true feelings of love for him. D.A Sinclair who was transforming innocent students into his armoured Reanimen. The underground menace of Doc Seismic. His continued success garnered Mark even more fame, and he suddenly became a household name throughout most of the world. But even more importantly, he deciphered the meaning behind his father’s final message. While on Earth, Nolan wrote several science fiction books which chronicled his life as a Viltrumite conqueror. Moreover, each book revealed a specific weakness of the Viltrumite race; weaknesses Mark could exploit when he eventually faced them. Shortly thereafter, Mark was visited once more by Allen the Alien and he shared all of the knowledge he had accumulated with him since his last visit. Mark expressed his affection to Eve and told her that he realized it after “future” Eve confessed her feelings for him. Confused, Eve asked Mark if he only had the feelings that he had because of the other Eve’s confession. When Mark could not answer, she left in embarrassment. Later, while he was visiting with his mother, Mark was approached by an agent of the Viltrumite Empire named Anissa. Anissa had come to inspect Mark’s progress in taking over the Earth. When she saw that he had made no progress, she attempted to persuade him to do his duty to the Empire and that in the end it would be for the best for humanity. Mark politely refused, which frustrated Anissa to the point where she attacked him. When Mark didn’t retaliate, Anissa calmed down and left the Earth after once again reiterating that the time would soon come where Mark would have to either chose to side with the Viltrumites or die. After a few days had passed, Mark flew to Africa in the hopes of convincing Eve that his feelings were genuine. He flew back and forth across the continent until he found her working in a small village. The two only had a moment for their awkward reunion before Mark was summoned by Cecil to deal with the return of Doc Seismic, who had managed to capture every superhero in the United States. As Mark prepared to leave Eve offered to lend him a hand in the upcoming battle. Mark accepted and the two raced back across the Atlantic Ocean and confronted Doc Seismic in his underground layer. Despite their vast power, the two young heroes were overwhelmed by the raw strength of Doc Seismic’s subterranean creatures. All seemed lost until a GDA teleportation portal opened and Darkwing with army of Reanimen poured through. Darkwing and the Reanimen wreaked havoc amongst Seismic’s forces while freeing the captured heroes. In only moments, Seismic’s forces were in full retreat and Doc Seismic himself was captured and unconscious. With the immediate threat of Seismic neutralized, Mark attempted to apprehend Darkwing once more but was stopped by his confused allies. It took Mark a few moments to realize that Darkwing’s crimes had not been made public. Worse still, Mark recognized that the designs of the Reanimen were based on the work of D.A. Sinclair, yet another villain he had turned over to the GDA. At that moment, Cecil entered the battle field and ordered Mark to stand down. Left with little choice, Mark left with Eve in tow. He only spent a few minutes explaining his actions to Eve before he decided that he could not turn a blind eye to what he knew was happening. With that, he flew to the Pentagon to confront Cecil. Cecil had been expecting his visit and the two entered into a heated debate. Cecil admitted to Mark that he would align himself with any and everyone that would provide him with a greater ability to protect the Earth, even if it meant working with murderers and psychopaths. Mark, outraged at Cecil’s callousness, boldly stated that D.A. Sinclair would pay for what he had done. As Mark grew more agitated, Cecil decided to take action. He lured Mark into an ambush and had a virtual army of Reanimen surround him. Enraged, Mark started destroying Cecil’s artificial army until Cecil activated the weapon he had secretly installed in Mark’s ear piece when they first started working together. The weapon caused Mark intense pain, and he was forced to retreat. Mark rocketed away from the Pentagon in the attempt to escape Cecil’s transmitter, and eventually ended up at the Guardians of the Globe headquarters in Utah. He had just finished telling the gathered Guardians what had happened when Cecil appeared and attacked him again with more Reanimen. The Guardians sided with Mark and eventually neutralized the weapon that was torturing him. As the heat of the battle faded, Cecil realized that he had over-reacted and called the fight to a halt. He then fired Mark (due to the fact that he felt they could not trust one another after what had just happened) and the assembled Guardians who took his side. Before Cecil could leave, Mark warned him that should he interfere with Mark or his family that he would kill him. Mark returned home later that night, and recounted the events of the day to Eve and his family. Before Eve could leave, Mark confessed to her the days events made him realize exactly how much he loved her. Despite his loss of employment, Mark did not gain a large amount of free time. He continued to fight crime when and wherever he encountered it, mentored Oliver in the use of his powers and spent what little time that remained with Eve. Oliver’s burgeoning power soon proved to be an issue. In a matter of weeks, Oliver’s strength and speed had grown to a point where they eclipsed that of virtually every earth-born hero, save Mark. To make matters worse, Oliver saw little value in human life. When Mark and Oliver confronted the Mauler Twins in a Wyoming based nuclear missile silo, Oliver murdered the Maulers in cold blood. Horrified by his brother’s actions, Mark tried to reprimand Oliver and bring him into line. Oliver refused to listen and a wedge grew between the two. In the meantime, Mark’s flirtation with Eve blossomed into a full grown relationship, and the two set out on getting the loose ends of their lives in order. Without Cecil’s support, neither Mark or Eve had a steady source of income. In answer to their need, Mark and Eve started a business named Invincible Inc. which was designed to sell Mark’s protection to anyone that could pay for it. Before long, Mark had a few lucrative contracts which would support his family for quite some time. Soon thereafter, a group of 16 extra-dimensional dopplegangers of Mark appeared across the Earth and began to ravage the planet in an attempt to discredit Mark’s name. 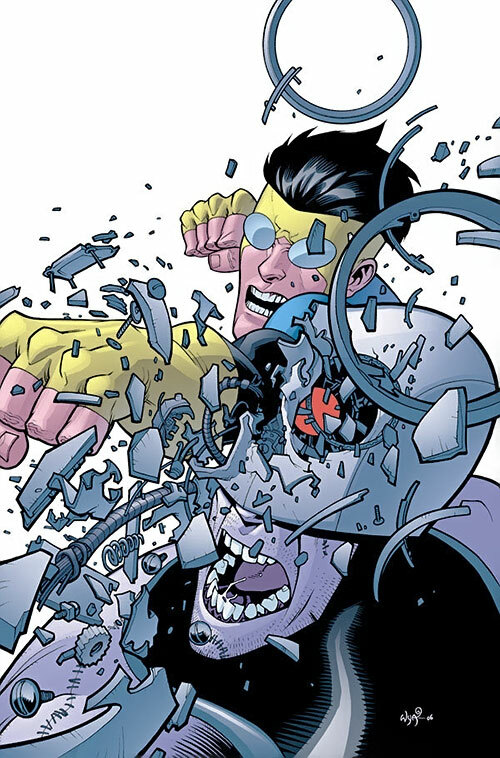 In the opening moments of the “Invincible War” Mark flitted from hot spot to spot and engaged his doppelgängers in direct conflict. He defeated two of them, but not before Atom Eve was critically injured. Unable to bring himself to leave her side, Mark left the war. By day three of the war, the cities of the Earth had suffered untold millions of dollars of damage and all of its heroes had been either defeated or killed. It was at this point that Angstrom Levy finally revealed his presence. He had survived the beating that Mark had given him in the alternate dimension and had brought the extra-dimensional doppelgängers to Mark’s reality. When the doppelgängers eventually refused to follow Angstrom’s commands (due to the fact that Levy reneged on his deal to expand their Empires), Levy banished them to the very same dimension that Mark had nearly killed him in. At that point, Mark re-entered the battle and after a brief confrontation with Levy, forced him to retreat to an undisclosed dimension and thus ended the war. Mark spent the majority of the next day helping with relief efforts and at Eve’s bedside waiting for her to regain consciousness. As the day wore on, he found less and less survivors and more and more corpses. Each small death affected him greatly and his guilt grew close to overpowering. During one of his visits to Eve’s bedside, Cecil approached Mark and asked him participate in a meeting regarding the Guardians of the Globe. The Guardians were hit particularly hard by one of the more vicious doppelgängers. Darkwing was presumed dead and the Immortal and Dupli-Kate were retiring from active duty. Cecil had hoped that both he and Mark could let bygones be bygones and have Mark return to the fold as the new leader of the Guardians of the Globe. Mark politely turned down Cecil’s offer and returned to his aid work. Mark wasn’t working long when a particularly menacing looking Viltrumite dropped from the skies above him. The alien identified himself as Conquest and claimed that if Mark didn’t immediately comply with his orders that both he and his planet would be forfeit. Anger bubbled up from Mark, and he attacked Conquest with all of his considerable might. Their fight raged across the face of the planet and caused millions of dollars of damage to the already ruined landscape. However, despite his best efforts, it was clear that Mark was absolutely no match for Conquest. When the battle took a turn for the worse, both Oliver and Atom Eve attempted to intervene on Mark’s behalf. Neither managed to even slow down the aged Viltrumite. Conquest easily shattered Oliver’s arm and punched one of his arms through Eve’s torso and left her for dead. Mark held Eve quietly as she slipped away, all the while listening to Conquest’s taunts. When she had gone, he attacked Conquest with renewed vigour but even his renewed rage wasn’t enough to fell the mighty Viltrumite. In the end, it took the combined strength of Mark and Atom Eve (who’s powers returned her to life) to finally kill Conquest. In the aftermath of the battle both Mark and Oliver were committed to the same medical facility that Eve had been recovering in. The events of the past week weighed heavily on Mark’s mind while he recovered, and he eventually came to a decision. He decided that Oliver had been correct before, and that from that point forward he would no longer hold back against any enemy who posed a threat to those who depended on him for protection. He would kill them all. Over the next several weeks, Mark recovered fully from the damage that he had received during his battle with Conquest. He attended the funerals of his fallen allies and continued to aid in the reconstruction of the cities around the world. While in the process of cleaning up, Mark was attacked by the terrorist Dinosaurus. Mark easily defeated his reptilian foe, but was prevented from killing him by the arrival of the Guardians of the Globe. Soon thereafter, Mark and the Guardians were forced to repulse yet another invasion by the Sequids. During the course of the battle, Mark was faced with the choice of either killing their host, Russ Livingston, or trying to save him. After a moment of consideration, Mark went with the “easy” solution. He decapitated Russ with a single punch and instantly ended the Sequid invasion. Mark, shaken by his actions, returned home filled with remorse. While there, he confided in Eve that he was worried that he had begun to lose control. Cecil interrupted their conversation at that point and echoed Mark’s concerns. He gave voice to his concerns that Mark’s Viltrumite heritage and his built-in aggression had begun to affect his judgement. Cecil’s words struck a chord with Mark, and after a violent encounter with Titan and a conversation with Art the Tailor, Mark decided that he was done with killing. Mark barely had a moment to reflect on his decision when his father returned to the Earth. Nolan explained that upon his escape from the Viltrumite prison, he had joined a Coalition of Planets that had been gathering weapons and allies for the upcoming assault on the Viltrumite Empire. He went on to say that the Coalition needed Mark’s strength in the upcoming war. Mark took a day to say good-bye to both Eve and his mother before journeying to Coalition space along with: his father, Allen the Alien, the armoured hero Tech Jacket, and Oliver who had convinced Nolan that he needed to join them. Their voyage, which took several weeks, came to an abrupt end when their ship was destroyed by a Viltrumite assault team. To Mark’s shock, Conquest led the trio of Viltrumites. He barely had a moment to consider the ramifications of Conquest’s appearance before the Viltrumites attacked once more. Both Nolan and Oliver attempted to defeat Conquest at the onset of the battle, but Mark ultimately engaged him in a one on one battle on the surface of a nearby planet. As their battle unfolded, Conquest revealed he had been kept alive and entombed deep within the earth but that his captors grossly underestimated his raw power. Mark, however, did not. Ultimately, he choked Conquest to death on the surface of the planet but not before being grievously wounded himself. Mark lapsed into a deep healing coma, which lasted for approximately 10 months. While he slept, Nolan and Oliver tended to his wounds and physical needs. When he eventually recovered, he and his family completed their journey to the Coalition home world. They arrived at Talescria while a major Viltrumite assault on the planet was taking place. Their strength, combined with the military might of the Coalition, turned the tide of the battle and forced the Viltrumites into a full out retreat. Word of the Coalition victory spread quickly, and less than a day later over 80% of the Viltrumite Empire had rebelled against Viltrumite control. With the groundswell of support on their side, Mark joined a high powered assault force led by Thaedus (the leader of the Coalition of Planets) himself in an impromptu strike on the planet Viltrum itself. The assault force attempted to covertly approach the planet but were discovered as they passed its outer ring. Before they knew it, they were under attack by all of the remaining Viltrumites in the universe. 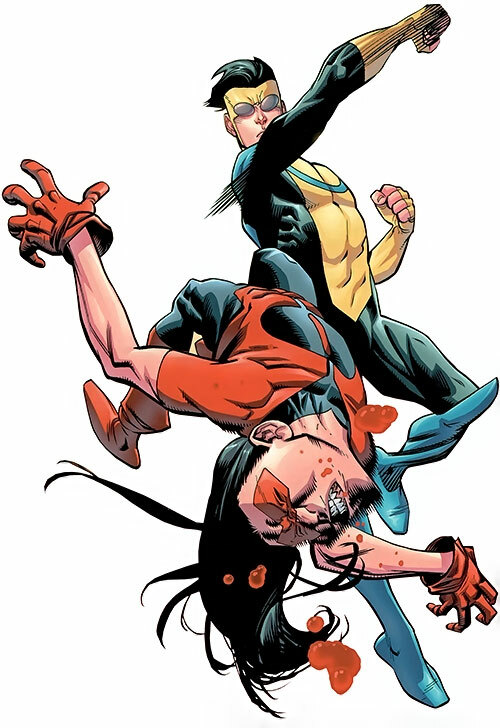 Mark flitted from opponent to opponent during the fight until he witnessed Thragg casually dismember Oliver. In retaliation Mark, Thaedus and Nolan destroyed the planet Viltrum. Instead of demoralizing the remaining Viltrumites, the destruction of Viltrum galvanized their forces and infuriated Thragg. In a blink of an eye, Thragg beheaded Thaedus and brutally beat both Mark and Nolan into unconsciousness and left them for dead in the darkness of space. Both Mark’s and Nolan’s unconscious forms were recovered by Coalition forces before they could succumb to the darkness of space. Mark spent the next two weeks unconscious and under the care of Coalition doctors. When he eventually regained consciousness, he was relieved to discover that both his father and brother survived the battle and were on the mend. To his surprise, while he was unconscious Allen had been appointed the leader of the Coalition of Planets. Under his watch, the remaining Viltrumite worlds had been liberated, while the former despots had simply vanished following the battle of Viltrum. With a sudden flash of insight, Mark realized what had happened while he had been unconscious. The Viltrumites had abandoned their Empire for the more fertile grounds of Earth. Mark begged Allen for the fastest ship he could spare to travel back home. Nolan and Tech Jacket joined him, while Oliver remained on Talescria to continue recovering from the damage he received at Thragg’s hands. The flight home was uneventual yet nerve-wracking for Mark as he imagined all the possible damage that the remainder of the Viltrumites could be causing on Earth in his absence. When the ship finally arrived in Earth space, Mark rushed down to the planet only to find nothing had occurred in his absence. A sense of relief filled his heart until Thragg confronted both he and his father in the skies above the Earth’s surface. Thragg made Mark a simple offer; the Viltrumites would be allowed to stay on the Earth, breeding quietly until they could replenish their numbers or they would simply raze the planet to the ground. Left with little choice, Mark agreed to Thragg’s terms and both parties departed without further incident. With the Viltrumite War finally over, Mark attempted to reclaim his former life. He returned to his home (with Nolan in tow) hoping to find his mother and Eve waiting. They found Debbie at home, and the three shared a tearful reunion. After the moment had passed, Debbie told Mark that he needed to go see Eve as she hadn’t handled his absence well. Mark found Eve at her parents house. To his surprise, he found that Eve had gained a significant amount of weight during his absence. Though she feared that her weight gain would affect their relationship Mark assured her that it made no difference to him at all. With Eve’s doubts alleviated, Mark returned to doing what he did best; punching bad guys. He spent the next couple of days battling several of his old foes under the auspice of Invincible Inc. In rapid succession he defeated the likes of: Furnace, Kursk, Doc Seismic, The Insomniac, The Giant and the Elephant. Later, Mark joined Eve on a visit to the Immortal and Dupli-Kate’s home for a dinner party. The night was a pleasant experience for Mark, though Eve had been somewhat awkward around their host’s children for the entire night (Kate had given birth to a pair of twins during Mark’s absence). At one point after the twins had a bath, Eve rushed out of the home in tears. When Mark joined her outside to see if she was okay, Eve revealed that she had been pregnant before he had left for the war. Faced with the thought that he may never return, she had an abortion. Feeling nothing more than regret and sorrow, Mark simply held Eve and apologized for leaving her alone. After spending the night talking, the two returned home to find Nolan and Debbie preparing to leave for Talescria. While Mark was out, the two had managed to reconcile, and moreover, Debbie wanted to make sure that Oliver was recovering from the war. The next day, Mark was summoned to face Dinosaurus in Las Vegas. When he arrived the two fought briefly, but ultimately Mark failed to stop the villain’s plans. Dinosaurus set off a massive explosion that reduced the entire city and its civilian population to a sheet of glass. Shaken by Dinosaurus’ actions and his failure to prevent it, Mark began to re-evaluate his approach to handling dangerous situations. Over the next few days, the beginning of a plan began to germinate in his mind. His idea was solidified when he saw the results of Dinosaurus’ actions. The US Government had reclaimed the land that used to be Las Vegas and turned the massive field of glass into a series of giant solar panels that would provide clean energy for half of the country. Exactly as Dinosaurus had planned. With the results of Dinosaurus’ plan in front of him and the Guardians of the Globe available to handle the more pedestrian threats, Mark made a choice. He broke into the Pentagon and freed the reptilian villain. He then put himself in Dinosaurus’ service. The two agreed to work together to build a better world, for as long as Dinosaurus’ plans didn’t threaten innocent lives. The two former foes started to implement changes across the face of the globe, while being hunted by the GDA. Eventually, when he attempted to visit Eve, both Cecil and Eve did their best to convince Mark that though his ends were noble, that he was misguided in trusting Dinosaurus. The two were making little headway when Cecil was alerted to Allen the Alien’s presence just outside of Earth’s orbit. Before Cecil could send a team of Guardian’s, Mark rocketed out of his former home and into space to greet his old friend. Unfortunately for Mark, their reunion was not a pleasant one. Allen had come to the Earth to eliminate the Viltrumite threat contained within. He planned to do so by unleashing the Scourge Virus into the populace. When Mark realized that the virus could also wipe out humanity, he insisted that Allen stand down. Oliver, who had accompanied Allen back to the Earth, tried to convince Mark of the soundness of their logic. Mark remained undeterred and when the talks seemed deadlocked, half-heartedly attacked his former friends. Before the situation could truly degenerate though, something unexpected occurred. Grand Regent Thragg appeared on the scene and took Mark’s side. Allen and his forces stood down immediately in Thragg’s presence and the two sides parlayed. Allen, left with little choice, had just agreed to Thragg’s terms (to leave the Viltrumites in peace on Earth) when the Guardians of the Globe arrived on the scene and attempted to take everyone into custody. Oliver took advantage of the Guardians’ distraction, stole the Scourge Virus from Allen and dove into the Earth’s atmosphere. Mark plunged after Oliver with desperate speed and the two brothers struggled over the weaponized virus high in Earth’s atmosphere. During their struggle, the weapon accidentally fired and Mark received a full dose of the Virus. Horrified Oliver stood down and both he and Allen took Mark back to the only people who had experience with the Virus; the Viltrumites. Thragg took Mark to his battle cruiser on the dark side of the Moon, while Allen retrieved Dinosaurus from the Earth’s surface in the hopes that his genius could help save Mark. As it turned out, Mark had an unusual resistance to the weaponized Virus strain and would recover all upon his own. During their examination, Thragg’s scientists discovered that Mark was a direct heir of Argall, the deceased Viltrumite Emperor. Unwilling to surrender his position of power, Thragg murdered the scientist that made the discovery and attempted to kill Mark while he rested in a healing coma. He was stopped by Dinosaurus, who had as an insurance policy placed bombs throughout the Viltrumite carrier that were tied into his own physical well-being. 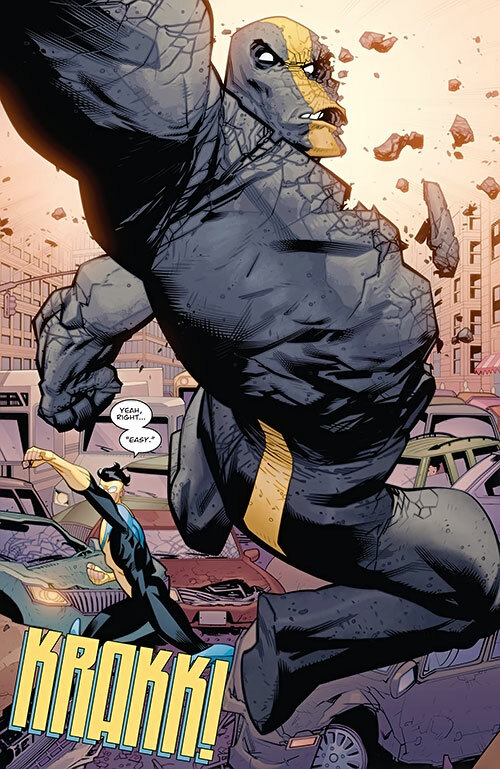 The beating he received at Thragg’s hands (while protecting Mark) triggered the bombs and forced Thragg to triage the damage long enough for the pair to escape. Upon earth-fall, Mark regained consciousness but soon discovered that the virus had stripped him of his powers. As a result, he found himself side-lined from several events that threatened the Earth’s safety including yet another invasion by the Thraxxan Empire. Mark remained powerless for several weeks. During that time, Dinosaurus proceeded with his own plans. When Mark’s powers eventually returned, he sought out his reptilian ally only to find his greatest terrorist act already underway. Dinosaurus, not knowing whether or not Mark’s powers would return, planted powerful explosives throughout the city of Los Angeles and Greenland. Mark and the Guardians managed to diffuse the situation in Los Angeles, but failed to stop the threat in Greenland. Soon, Greenland’s land mass was destroyed which sent tons of ice and rock into the ocean and triggered massive tsunamis. San Diego, New York, Paris, Dubai, Tōkyō and Sidney were devastated and covered in sea water. In a blink of an eye, millions of people were dead. Enraged by the destruction, Mark attacked his former ally while the Guardians of the Globe helped to evacuate civilians world wide. Mark and Dinosaurus traded titanic blows with one another while trying to convince each other of their own point of view. Eventually, Dinosaurus got the upper hand over Mark and seemingly murdered him in plain view of the media helicopters that had been observing the fight. In truth, Dinosaurus had used a weapon of his own design that took advantage of Mark’s unusually vulnerable inner ear to place Mark into a comatose state. Then, in a moment when he was hidden from the media’s prying eyes replaced Mark with a lifeless clone of Mark which he killed in front of the world. He had done all of this in the hopes that without any obligations or distractions from a world that thought he was dead that Mark would join him fully. Incredulous, Mark refused Dinosaurus’ offer and eventually managed to convince Dinosaurus of not only his incorrectness but of his insanity. Realizing that this moment of clarity would be temporary, Dinosaurus then asked Mark to kill him before he reverted back to his former state. Left with little choice, Mark obliged his former ally and beat him to death. Riddled with guilt over Dinosaurus’ actions, Mark surrendered himself to Cecil and the GDA in the hopes of atoning for his part in the disaster. Cecil refused his surrender and instead made Mark an offer he couldn’t refuse. Cecil would keep Mark’s involvement in the entire affair a secret and spare him any form of imprisonment if he simply re-entered his employ once more. After all, Cecil stated, he had worked with villains before. Incredibly, Mark’s life returned back to as normal a state as it got for him. Nolan and Debbie had returned to the Earth while he had been dealing with Dinosaurus, but were forced to live on the Moon in order to keep Nolan’s presence hidden from humanity. With his parents out of the family home, Mark and Eve decided to live in it together. Eve had become pregnant once more (presumably while Mark had been de-powered) and the two got engaged soon thereafter. All the while, Mark started dealing with superhuman threats to mankind once again at Cecil’s behest. Immediately before he became engaged to Eve, Nolan summoned Mark to the Moon. When Mark arrived, he was informed that Nolan was the rightful heir to the Viltrumite Empire and had claimed the throne from Thragg. The full ramifications of this fact have yet to be revealed. Mark Grayson is a handsome Caucasian man that possesses a lean, muscular build. He doesn’t have the massive body frame that most Viltrumite males possess but this may change as both he and his physique continue to mature. Mark’s eyes are a bluish grey colour and his hair is usually worn in an unruly mop on top of his head. It is longer on top than it is on its sides. Mark’s civilian garb is usually jeans or cargo pants and a loose-fitting t-shirt. 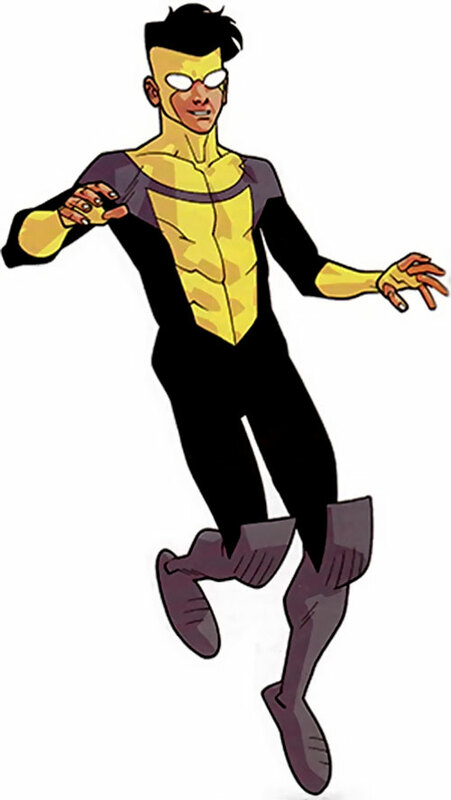 As Invincible, he wears a black body suit with blue knee-high boots, yellow fingerless gloves that extend over his forearms, and a large yellow ’i‘ on his chest. A blue band wraps around the shoulders of the costume and cuts between the dot and the body of the ’i‘. 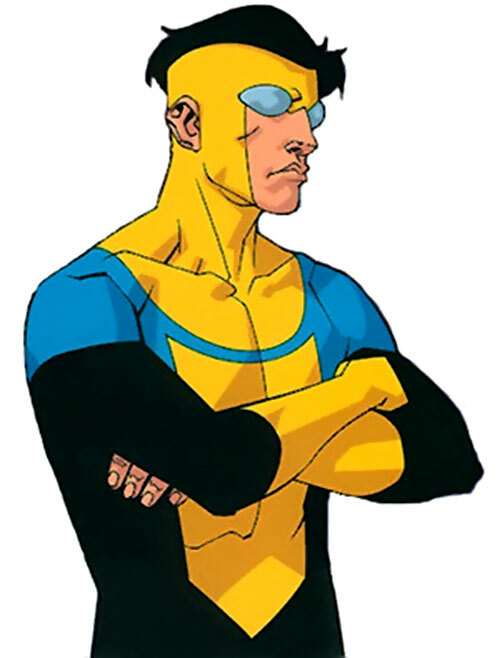 The yellow dot of the ’i‘ extends into a cowl over Invincible’s head that leaves the top of his head, his ears, and his lower face exposed. 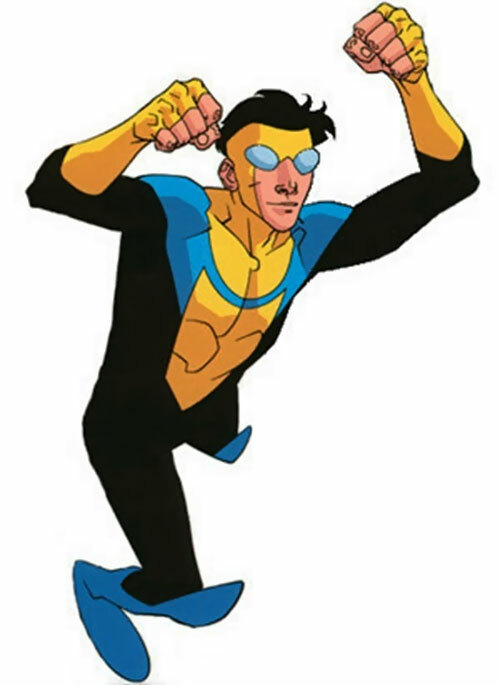 His eyes are covered by pale blue fisheye goggles, much like those of the DCU’s Blue Beetle’s. 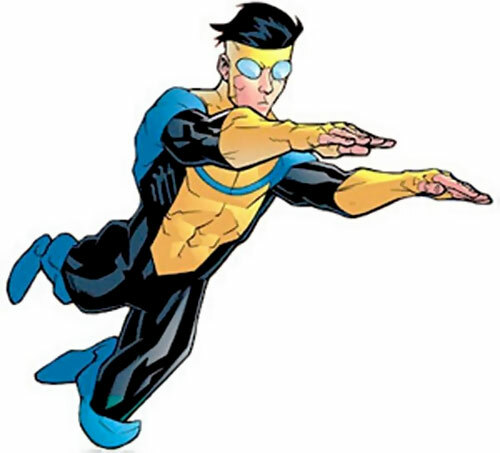 After he left the GDA, Invincible adopted a simpler, darker costume. 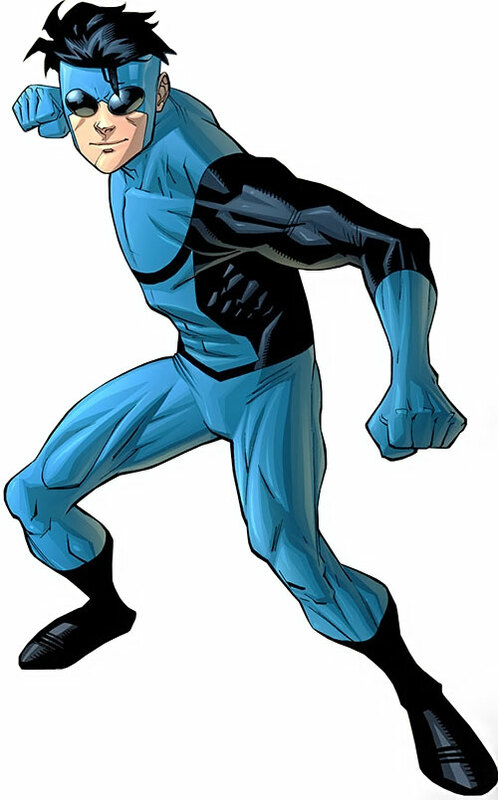 The lower half from the waist down is blue with black calf-length boots, while the upper half is black with a large blue “i” and blue forearm-length gloves. 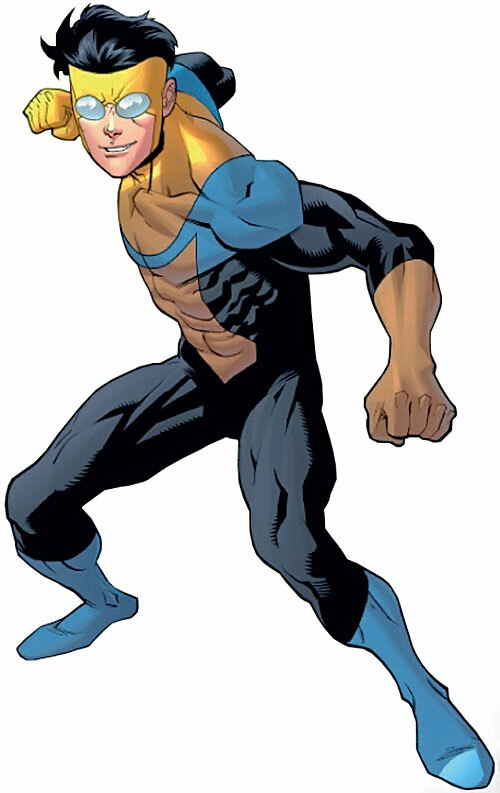 The blue dot of the i extends into a cowl over Invincible’s head that leaves the top of his head, his ears, and his lower face exposed. His eyes are now covered by black fisheye goggles. He began using his old uniform again after reconciling with Cecil Stedman in the wake of the Invincible War. Though he has only been a superhero for a relatively short period of time, Mark’s personality has evolved as quickly as his powers. Initially Mark was a normal and friendly young man with an instinctive drive to aid his fellow man. He used to love simply using his powers and often battered his opponents with not only his fists but liberal amounts of sarcasm. Over the years, Mark has grown into a much more serious man who approaches situations of conflict in a far more cautious manner. This change was born out of a deeper understanding of who he is and what he is capable of. Mark is a man who has an unyielding sense of right and wrong. Once he has made a decision, he will do everything in his power to see it through. If that means that he needs to fight his best friend, father or wife then he will do so no matter what the personal cost. Initially this was fine as his ideals were relatively black and white. But with age, Mark has shown that he has come to see the world in shades of grey. Gone are the days where he believed that all killing is “bad” and that heroes had to stand for something greater. He has come to believe that sometimes he needs to take a life in order to preserve another. When push comes to shove, Mark is willing to make the hard choice and do what most other heroes have shied away from in the past. However, past experience has taught Mark about the consequences of his actions and as a result he has started to hold back far more. His willingness to parlay or negotiate with his foes has increased with age (though he was always prone to speaking more than his father). Unfortunately, Mark is still a Viltrumite and his temper can get the better of him more times than he would like. He recognizes this fact and does his best to control his natural aggression. Despite his ever growing maturity, some aspects of Marks personality have remained constant. He is still an extremely likeable man that loves his family deeply. He forms deep and strong bonds with those who are close to him and is willing to see the best in everyone. He is still prone to overt displays of cockiness (which is somewhat understandable since he is the Earth’s strongest hero) despite the number of times he has been defeated in battle. And last but not least, Mark still loves comic books and makes every effort to visit his local comics shop to stay up to date on his favourite book – Science Dog. Mark deeply loves and respects his father and maintains a strong relationship with him despite the time and distance that often separates them. In times when he is filled with doubt, he often turns to Nolan and seeks advice. Now that Mark is on the verge of fatherhood himself, he fears that he will not be as capable a father as Nolan was to him. These concerns are not only common but healthy and show that he is far more ready for this responsibility than he is aware. Due to the machinations of Angstrom Levy, Invincible briefly visited the DC Universe and met Batman. 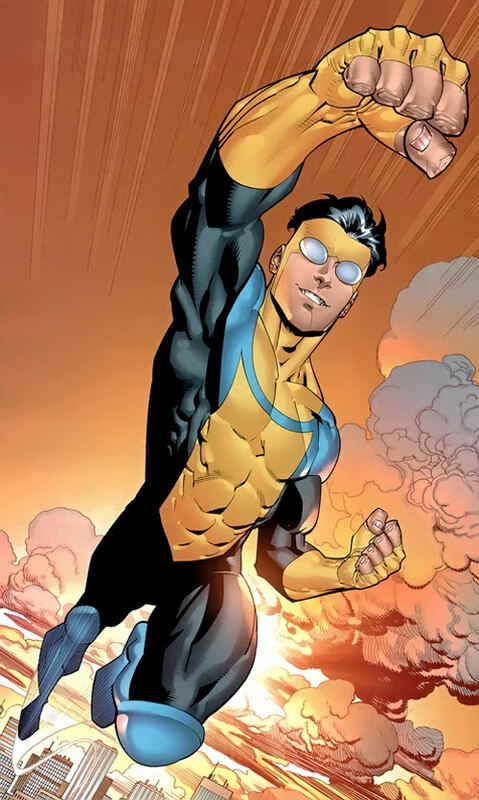 However, if a player wished to incorporate Invincible directly into the DC Universe, they could utilize the following method. 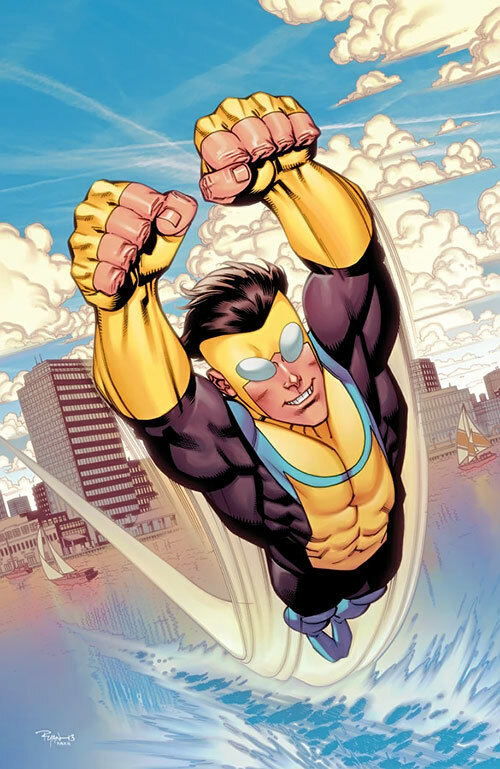 Since Omni-Man and Invincible assisted other heroes but worked independently (in other words, not being full-time members of any supergroup), they could be inserted as is. Placing them on the west coast of the United States would give them enough necessary distance from the home turf of most other major DC heroes to avoid any troubling overlap. Since the original Guardians of the Globe (GOTG) were obvious analogues for the Justice League, it is possible to integrate the events of the series by having Omni-Man slaughter the actual JLA. Barring that extreme measure, it is entirely possible to simply throw in the GOTG as a separate super-team though, especially since they were based in Utah, comfortably far away from the east coast cities that were home to the members of the JLA. An intermediate measure would be putting the Global Guardians in the stead of the GOTG, which would also reflect the more international membership of the GOTG. 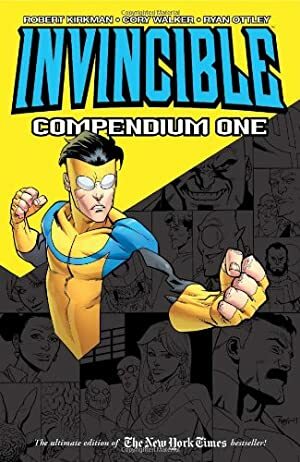 Due to the machinations of Angstrom Levy, Invincible briefly visited the Marvel Universe and teamed up with Spider-Man, the Avengers and fought Doctor Octopus. 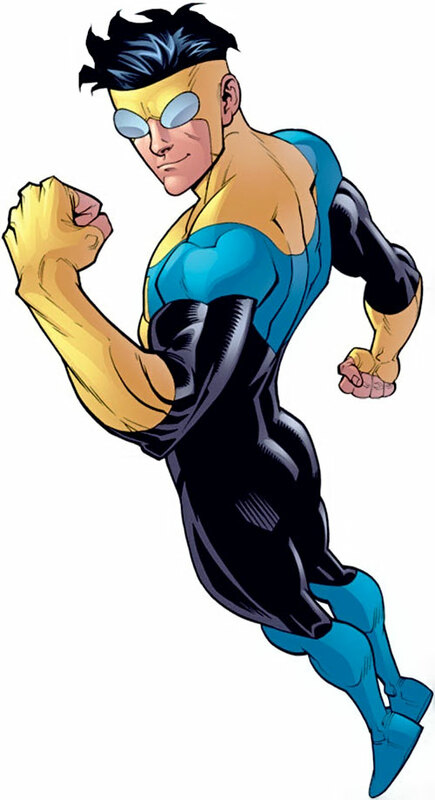 To more directly incorporate Invincible into the Marvel Universe, the Viltrumites could be an off-shoot of the Strontian race from which the Shi’ar Imperial Guard’s Gladiator hails. The team that first falls to Omni-Man might be an Avengers franchise that inadvertently came close to discovering his true mission. Iron Nerves, Lightning Reflexes, Near-Immortal (Potential Lifespan – 3000 years), Stabilization. Allen the Alien (High), Art the Costume Maker (Low), Atom Eve (High), Cecil Stedman (High), Guardians of the Globe II (Low), Monster-Girl (Low), Oliver Grayson (High), Omni-Man (High), Robot (High). Attack Vulnerability (-2CS vs attacks against the inner ear), Fatal Vulnerability (Scourge Virus), Gradual Loss Vulnerability (Scourge Virus, All Powers at 0 APs and Physical Stats reduced to 02 APs, Rare), Loss Vulnerability (Klaxus Plant, All Powers and physical attributes reduced by 04 APs, Rare), Minor Rage, Secret Identity. TELEPATHIC EARPLUG [BODY 03, Comprehend Languages: 06, Telepathy: 06, R#: 2 ; Limitations: Comprehend Languages: Spoken Languages only; Telepathy: Communication only, Cannot initiate psychic combat; Comprehend Languages and Telepathy only function in a Vacuum]. GOVERNMENT ISSUE EARPIECE [BODY 01, Radio Communications (Scrambled): 13]. Invincible Inc. Cell Phone [BODY 01, Radio Communication (Scrambled): 12, Bonus: Effective Range of Radio Communication is often much higher as it can piggy back off of any available local communications network (+2FC)]. Some debate has taken place online that places Mark’s raw STR somewhere below that of the average adult Viltrumite. However, his final battle with Conquest, utter manhandling of the Guardians of the Globe and recent contest of strength with his father point in the other direction. As a result, Mark’s strength has been set above that of the average Viltrumite warrior. Invincible seems to be one of those characters that actually follows MEGs rules for character development. His raw STR and powers have increased dramatically since his first appearance. At the start of the series, his STR/BODY scores were only 17/14, his INT, WILL, AURA, and SPIRIT were 1 AP lower, his INFL and Charisma Skill were 2 APs lower, he only had 40 HPs, and his Powers were 4 APs lower except for Superspeed, which was 13 APs. Superspeed also had the Limitations: Cannot Substitute for DEX and Does Not Add to Initiative. 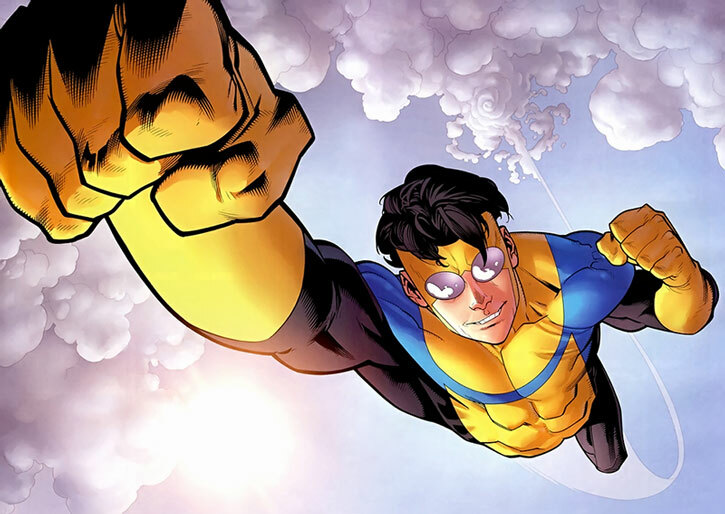 Many of Invincible’s stat increases came after battles in which he strove to his utmost, was defeated and spent an extended period recovering. Mark’s battle with his father. Mark and Nolan fighting the Viltrumite squad on Mantis-World (most notable for Mark finally overcoming his Superspeed Limitations). His dimension-hopping battle with Angstrom Levy. The brawl with Cecil Stedman’s Reanimen army (after which point he was almost a physical match for his father, as demonstrated by how casually he defeated the new Guardians of the Globe). The Invincible and Viltrumite Wars. The increases to his Mental and Mystical Attributes reflect the evolution of Mark’s personality. He has become increasingly clever, adaptable, and thoughtful as Invincible. 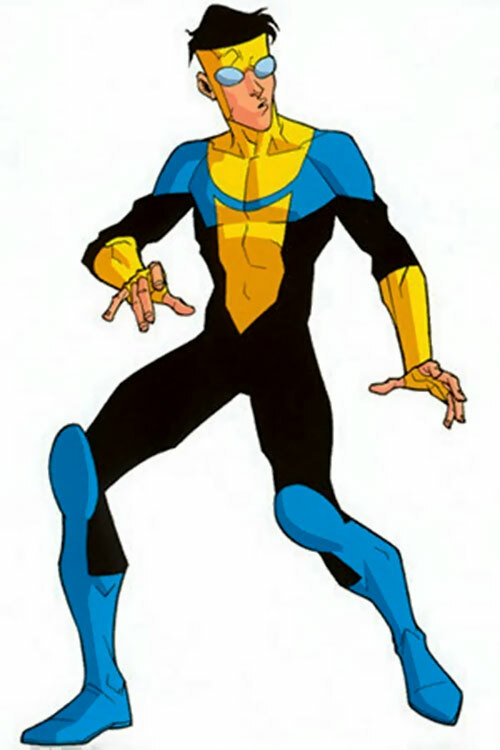 Some discrepancies exist between Invincible’s power levels as described in the series’s Official Handbook versus the series itself. The OHOTIU was heavily based on/influenced by the OHOTMU and was built on said scale. 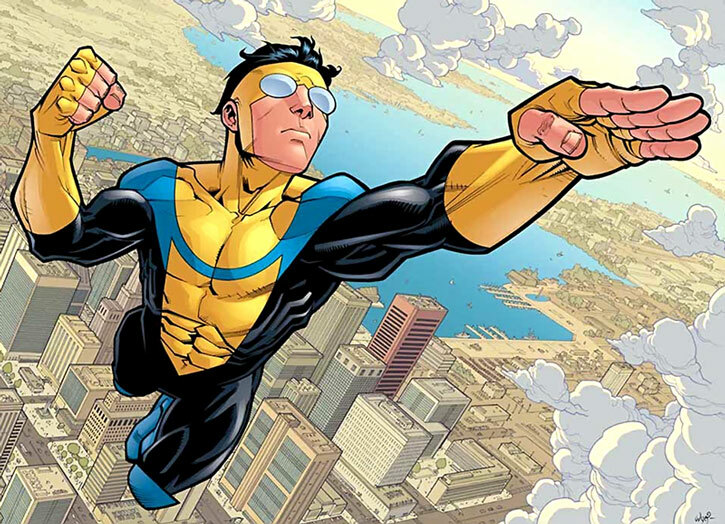 However, it is clear from the series that Invincible operates at a higher scale than that presented in the handbook. By Roy Cowan & Bryan Gittens. Helper(s): Chris Cottingham, Eric Langendorff, Dr. Peter S Piispanen, Darci. Writeup updated on the 17th of January, 2014.